(CBS/WBZ/AP) BOSTON - A man and woman who have been living in a tent with Occupy Boston protesters have been arrested for allegedly selling heroin to an undercover police officer. Issac Bell, 34, and Charlene Dumont, 31, both pleaded not guilty to drug possession and distribution charges at their arraignments Monday. 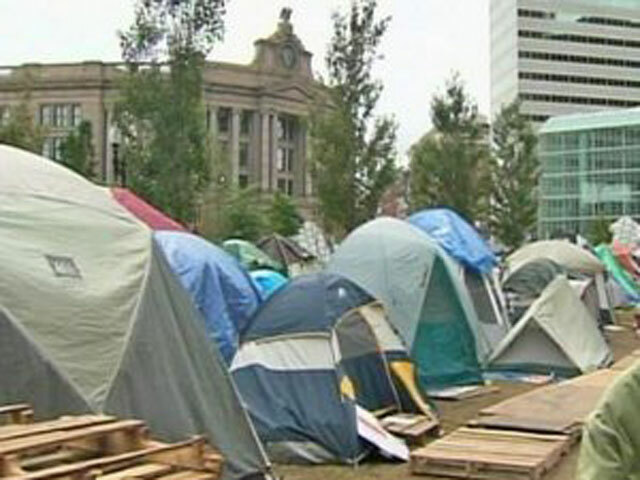 They were released on their own personal recognizance and ordered to stay away from the Occupy Boston encampment. Prosecutors say police set up a sting after learning of drug activity in the encampment. An undercover officer arranged to buy drugs from a man known as "Shorty," who was later identified as Bell. Authorities say the officer bought $80 worth of a substance believed to be heroin last Thursday from the 34-year-old Bell in the bathroom of South Station, near the encampment. Uniformed officers arrested Bell when he returned to his tent in Dewey Square, reports CBS station WBZ. Officers recovered the money used to buy the drugs as well as a small bag of heroin and empty plastic bags, WBZ reports. Dumont was reportedly arrested for her alleged role in the drug deals.